Updated 22nd January: Tell Me On a Sunday starring Marti Webb is to be broadcast on BBC Radio 2 this Easter as Radio 2 recorded a performance of the musical during its recent run at the St James Theatre and will air it in April. The special 60-minute programme will also include interviews with Webb and the show's lyricist Don Black. Updated 30th December: BBC Radio Two are to record this for broadcast (suspect for a Friday -Night is Music Night). Details to follow. 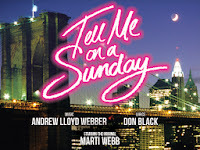 Marti Webb is again performing Tell Me On A Sunday which Andrew Lloyd Webber and Don Black musical wrote specially for her and which was premiered 24 years ago and then broadcast as a TV special. Webb said: “I love doing it, it’s just beautiful. It was wonderful to be there at the conception, so unusual that you’re watching someone as brilliant as Andrew sitting down at the piano and playing something and asking "What do you think of that? "I wasn’t young when I did it 10 years ago. Most likely it will be the last time I will do it.She said the charm of the story of a 35-year-old English woman newly arrived in New York was that she was an ordinary person: She is not theatrical. There are lots of girls who can identify with her. She’s funny, just like a normal person really". 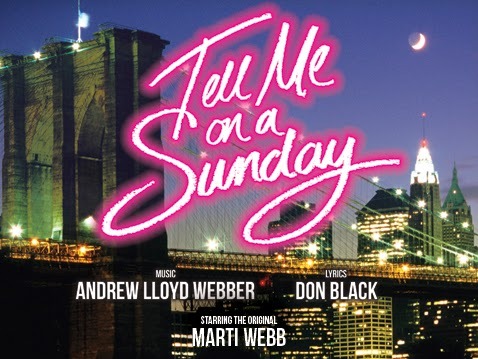 Marti Webb is performing Tell Me On a Sunday at the St James Theatre in London from January 7th-12th 2014.